Over eighty nursing professors and instructional designers attended the 5th annual (and final) WI TECNE conference entitled E-Learning: Design, Delivery, Innovation, and Evaluation that was held on April 7-8, 2011. The conference opened at Lambeau Field with a presentation on how technology and health are similar and different between nursing and the NFL, presented by Dr. Janet Reilly, the WI TECNE Year 4 and 5 campus leader at the University of Wisconsin, Green Bay. Faculty from each of the four UW System campuses next presented on how they have used technology in e-learning over the past five years of the HRSA funded WI TECNE grant. Topics covered included using virtual gaming, problem-based learning, case scenario builder software and wikis in e-learning with nursing students. After a tailgate style dinner buffet, keynote speaker, Dr. Diane Skiba from the University of Colorado, addressed the group about new trends in technology in nursing education. Friday’s WI TECNE session began at the Univeristy of Wisconsin, Green Bay campus with a presentation on sustainability and continuation of technology in nursing given by the WI TECNE Principal Investigator, Dr. Patti Brennan from the University of Wisconsin, Madison. Evaluation results of the Year Five Scholars and the Khan Flexible Framework for E-Learning was hosted by Dr. Christine Vandenhouten from the University of Wisconsin in Green Bay. Dr. Eric Bauman and David Simkins, both from Madison, reviewed interface design strengths and areas for improvement for the five core nursing courses in the BSN@HOME program. Attendees also selected three break out sessions from a varitey of e-learning topics: student perspectives of online learning; faculty overload in e-learning; legal aspects of e-learning; the 2011 Horizon Report; virtual gaming; e-learning and Native American, African American and disabled students; and academic dishonesty in e-learning. Presenters hailed from universities and private companies in Washington D.C, Pennsylvania, Ohio, Illinois, Minnesota and Wisconsin. Dr. Badrul Khan was the closing keynote speaker. He reviewed the Flexible Framework for E-Learning and its international applications. Congratulations to Nursing graduate, Crystalmichelle Malakar who participated in the “Posters in the Rotunda” annual event on April 6 at the Wisconsin State Capital. Students from University of Wisconsin campuses annually participate by showcasing examples of scholarship and interacting with legislators. Crystal conducted research along with the team of Drs. Mimi Kubsch, Derryl Block, Susan Gallagher-Lepak and Chris Vandenhouten. Crystal’s research project originated in Dr. Kubsch’s Nursing Research Course and developed into a survey of 500 plus RN’s, principally from Wisconsin, to document the level of political participation and the factors which influence political involvement. Higher levels of psychological engagement (political interest, efficacy, and information) followed by greater resources (time and money & civic skills) were most predictive of political participation. Dr. Vandenhouten served as the Principal Investigator for the research and accompanied Crystal to the capital. The UW-Green Bay Professional Program in Nursing is hosting the E-Learning in Nursing Conference April 7-8 as the culminating event of a five year Dept. of Health and Human Services, Health Resources and Services Administration (HRSA) grant to enhance educational technology in nursing courses. The conference will begin at historic Lambeau Field, home of the Super Bowl Champion Green Bay Packers where participants will hear Dr. Janet Reilly, Assistant Professor of Nursing at UW-Green Bay offer a presentation on Technology in E-Learning and Health in Nursing and the NFL. UW-Green Bay is one of five UW Nursing programs (also including Madison, Milwaukee, Eau Claire and Oshkosh) participating in the HRSA grant. Conference keynote speakers include Dr. Diane Skiba, Professor of Health Care Informatics at the University of Colorado in Denver; Dr. Patricia Flatley Brennan, Professor in Nursing at UW-Madison and the Principal Investigator for the HRSA Grant; and Dr. Badrul Khan, President and Founder of McWeadon Education, a world renown educator, author, speaker and consultant in the field of e-learning. Dr. Skiba will present Emerging Technologies in Nursing Practice and E-Learning. Dr. Brenan will offer Reflections and Sustainability of Technology Enhanced Nursing Education. Dr. Badrul will conclude the conference speaking about International and Cultural Perspectives in E-Learning. There will be an additional 16 presentations including reports of research and technologies developed over the five years of the grant. 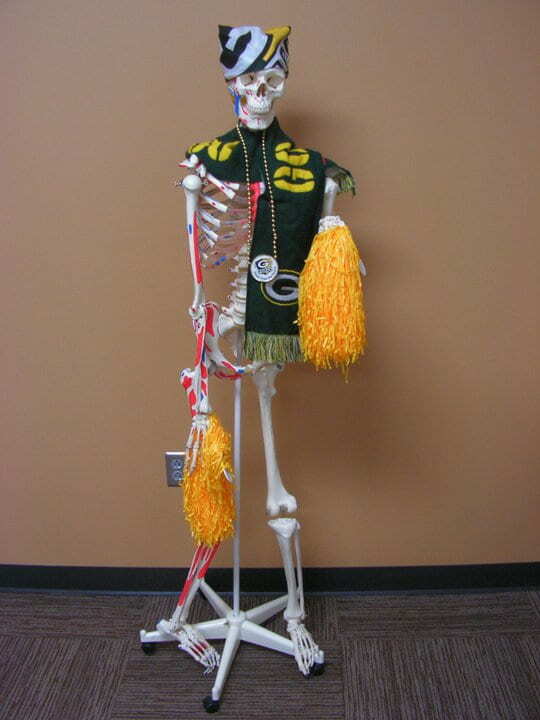 'The Nursing Skeleton,' normally and previously a dignified teaching device, is decked out in Packers gear as the Super Bowl approaches. It's on display at the Professional Program in Nursing suite on the third floor of Rose Hall. Tourulaetal2008 For those interested in more information regarding the practice of having infants taking naps outdoors in Finland as described by Dr. Janet Reilly’s post, please click on the attached pdf. Dr. Mary Jo DeVillers of our nursing faculty was awarded the degree of Doctor of Philosophy (Ph.D) from the Loyola University Chicago Nursing Program in July of 2010. Dr. DeVillers instructs a number of our courses including our capstone Synthesis for Nursing Practice, Theoretical Foundations, and Global Aspects of Healthcare. Congratulations Dr. DeVillers! Hola!! Travel Course to Mexico! 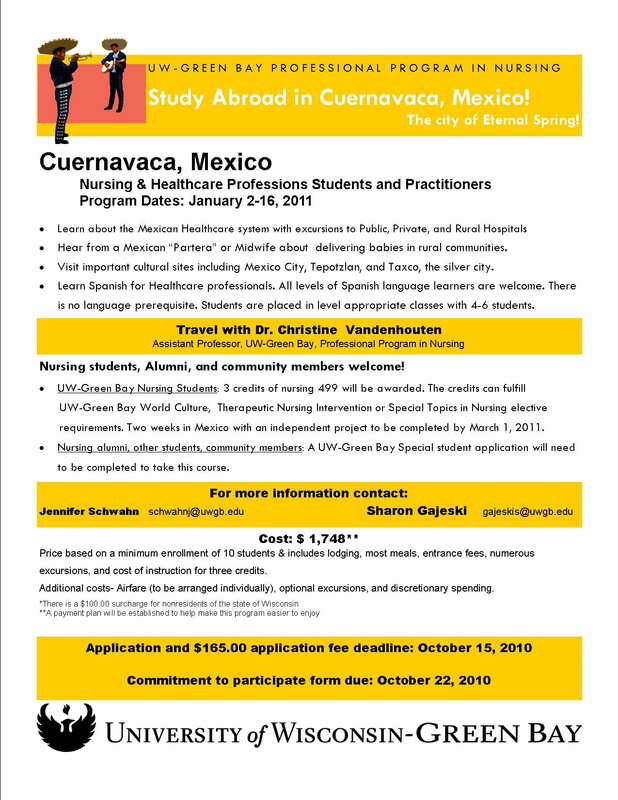 For the second consecutive year, the Professional Program in Nursing will be offering an extraordinary opportunity for RN to BSN students and alumni to participate in a travel course to Cuernavaca, Mexico. This 3 week travel course (N499) will run from December 27, 2010 – January 17, 2011 (including New Years Eve in Mexico!). Students will have the opportunity to learn about Mexican culture and healthcare and take Spanish language immersion classes (tailored to your level of language proficiency). Language class will occur each morning; Afternoons will be spent with speakers and field trips related to culture and healthcare. Cuernavaca is a beautiful city, dubbed the City of Eternal Spring, for its temperate climate. It is located about 90 minutes drive from Mexico City. This course may be counted for either a world culture requirement, special topic in nursing elective, therapeutic nursing intervention (TNI) elective or (after consultation with Dr. Chris Vandenhouten) towards the Community Health Nursing Practicum. There is no language requirement for this program. Alumni will need to complete an application as “Special Students” for purposes of the trip. All participants need to have passports. The total cost for this experience (including airfare, lodging, tuition, etc.) will run about $3000. The exact cost and final details will be available soon. Registration will begin after September 1, 2010. Please contact Ruth Pearson (920-465-2826 or pearsonr@uwgb.edu) if you are interested in this exciting opportunity. Gracias! How can students get a deeper understanding of the day-to-day challenges of those living in poverty? One way is through a Second Life computer simulation. Second Life is an Internet based 3D Virtual World. Nursing Professor Chris Vandenhouten, working with Instructional Designer Leif Nelson and student employees Julie Harvey and Kyle MacDonald, created a simulation program that students used to “experience” what it’s like for a family to live on the edge of poverty. On March 3, 2010, the simulation was used in the Community Health Nursing class with 15 students participating. Each student was assigned an Avatar, a “person” in a simulated family. The activity mirrored what it is like to live in poverty for a “month” during which unforeseen events add to the daily stress of life. The simulation sensitizes individuals to the day to day reality of living in poverty. It motivates them to become aware and involved in activities and resources which help reduce the effects of poverty in the United States. The students took time to reflect and de-brief with Dr. Vandenhouten following the simulation. Chad Sikora, RN and a student in the Leadership and Management course instructed by Brenda Tyczkowski, was a co-author of an article on implementing computerized medical records in the Neonatal Intensive Care Unit (NICU). The article, titled Implementation of an Electronic Documentation System Using Microsystem and Quality Improvement Concepts, appeared in an Advances in Neonatal Care recent publication. Congratulations to Chad!